Star Automation is one of the leading servo Systems Supplier in India. Star Automations, specializes in development, manufacturing and sales of high-quality low-cost motion control products. 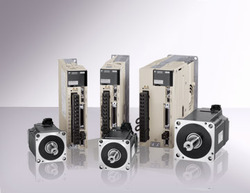 Offering Yaskawa servo pack, panasonic servo driver, delta servo drive and Mitsubishi servo Amplifiers, Omron servo and Servo motors. We are specialized in providing technical solutions and consultancy for these products. Star Automation Provide solutions to your Problems by designing and manufacturing Special Purpose Machines and Automation systems to satisfy your needs.